It might seem like it has taken a while, but the Android Market is starting to feel much more like an established market, especially with this new set of features that were introduced yesterday at Google I/O. Users have been waiting for ways to find apps easier using things like lists of top apps, apps that were related to ones they are purchasing, and even ones that are trending – that’s exactly what Google has given us and more. New top app charts – We’ve revamped our top app charts to be fresher and country-specific, so you get the most current, relevant results. 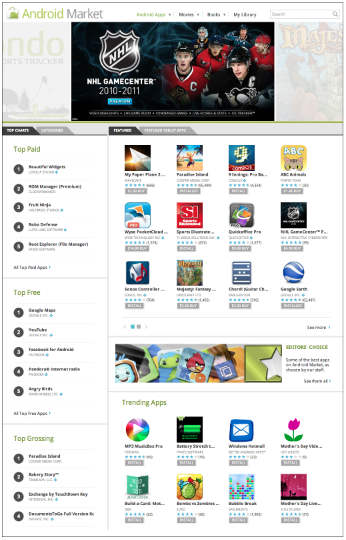 We’ve also added top new free, top new paid, and top grossing lists, all right on the Android Market home page. Top Developers – We’re also recognizing those developers creating the highest quality, most popular, and most notable apps available on Android Market. They’ll get a special icon on our Android Market website, appearing wherever the developer name is shown, starting today for an initial set of over 150 developers. Better related apps – On the left side of an app page, you’ll now see two groups of related apps: apps frequently browsed by people who viewed this app, and apps that people tend to install alongside this app. For example, people who view ScoreMobile, my favorite sports score app, often also view other sports score apps, while those who install ScoreMobile tend to also install apps for specific sports leagues or teams. We’ll also show you related apps once you decide to install an app. 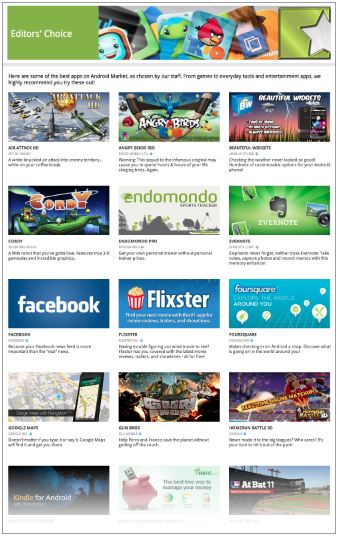 Trending apps – Finally, we’ve added a new section to the Android Market homepage showing trending apps – those apps that are quickly growing in daily installs. Look here to stay ahead of the curve and find new apps as they get hot.